WASHINGTON (Reuters) - North Korea’s recently launched satellite is once again tumbling in orbit, after stabilizing briefly, according to a U.S. official and other sources. The satellite update came as a key congressional watchdog agency said the U.S. military had not demonstrated its ability to protect the United States against a possible North Korea missile attack. 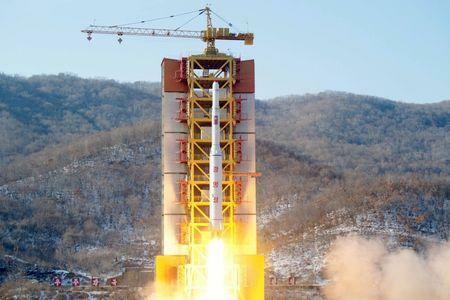 Earlier this month North Korea launched what it said was an earth observation satellite but what the country's neighbors and the United States called a missile test. It was earlier believed to have achieved stable orbit but not to have transmitted data back to Earth. The U.S. official, and two other sources with knowledge of the issue, said they are less concerned about the function of the satellite than with the technology involved in launching it. They added that the launch was clearly intended to demonstrate North Korea’s ability to launch an intercontinental ballistic missile. The U.S. Government Accountability Office, the research arm of Congress, highlighted concerns about missile attacks from North Korea in a report released on Wednesday. “GMD flight testing, to date, was insufficient to demonstrate that an operationally useful defense capability exists,” the GAO said. GMD is an acronym for a ground-based missile defense system. Ken Todorov, former deputy director of the Missile Defense Agency, said the organization faced a difficult balancing act in meeting the needs of the U.S. military and operating with limited resources for testing. Last month the Missile Defense Agency conducted a successful test of the ground-based U.S. missile defense system managed by Boeing Co aimed at demonstrating the effectiveness of a redesigned "kill vehicle" built by Raytheon Co. The test purposely did not include an intercept by a ground-based interceptor but was designed to demonstrate the ability of new "divert thrusters" that were developed by Raytheon to maneuver the warhead. The report said that while there were benefits in the way the agency was acquiring the kill vehicle, challenges remained.